A similar thing is also made in China, but the white line is very clear here. If you do not use a lot, I do not think it is an expensive part, so we recommend this. Unfortunately, because it is for φ6, it does not support φ6.4 such as made in USA. This review is about item#8626195. It was used as the knob of the rotary switch HS series, but it was not problem at all. This review is about item#8626204. I made it with a compact Takachi case so I am looking for a small knob and purchase this product I think that this size or the size of one size above will be comfortable if SW 65 ~ 75 is around. The color is perfect for the glossy feeling on the side of the case. This review is about item#08626204. It is an old-fashioned knob and has a sense of security. It is not hollow and is made of plastic filled with contents, so it is more solid than other hollow ones. This review is about item#8626186. Since shaft hole diameter · knob outer diameter was just right, purchase. It can be used without problems. This review is about item#08626177. 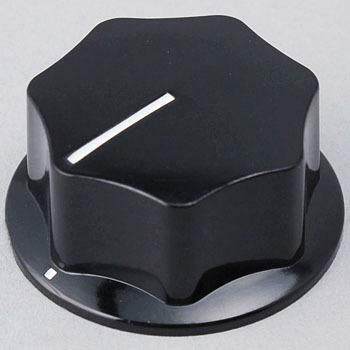 It is used as a volume knob of a so-called vintage amplifier. I changed the aluminum knob to this. It is perfect for the atmosphere of a vintage amplifier. Making and quality are also good feeling. I am very pleased to purchase it at roses. Thank you for your response. A decade ago, this was the voltage regulation of the stabilized power supply that was in the laboratory. By the way, K - 2195 was attached to Slidak. This review is about item#08626186. I knew that everything was OK. However, with the knobs from overseas manufacturers attached, the making is sweet and inevitably gets stuck obliquely. Of course this is not a problem for domestic manufacturers.